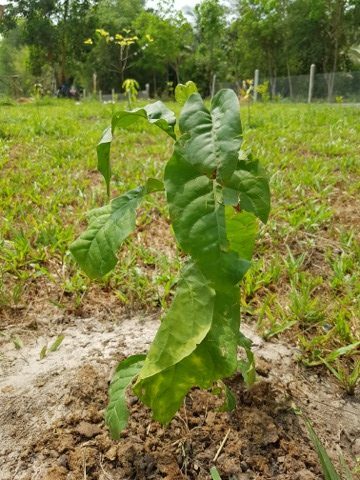 Growing a food forest is a long term project, but you have to start somewhere, sometime, to reap what you sow for many years to come. 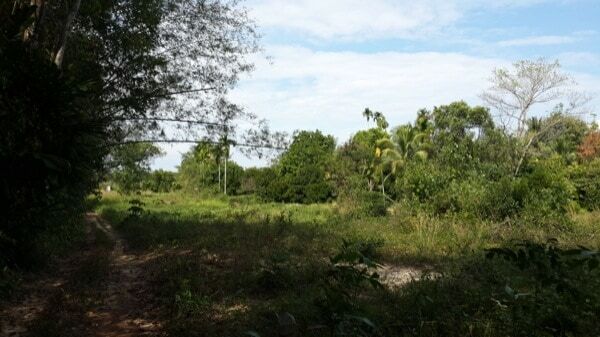 We earmarked approximately 70% of our 2 rai (about one acre) to build a permaculture food forest. 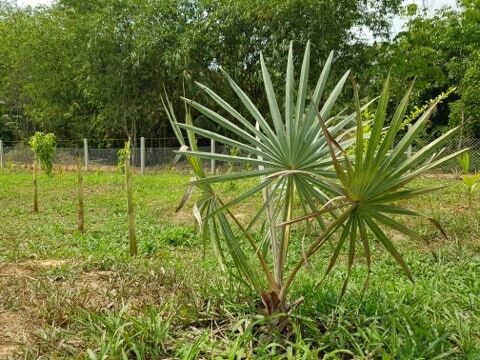 What is a Permaculture Food Forest? 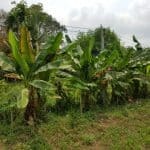 A permaculture food forest is an area of land designed to grow an abundance of trees and plants that are either edible or beneficial to the soil and environment. 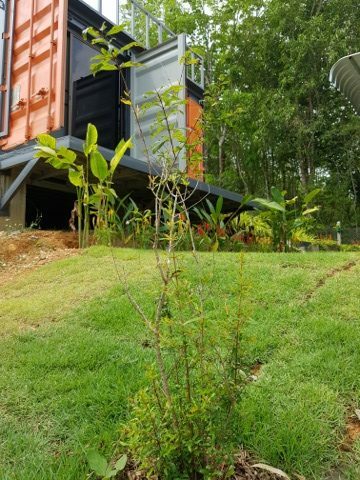 The idea is to mimic nature so there is the minimum amount of labor as the food forest matures. No one is pruning trees, cutting grass, watering plants or weeding in a forest. The forest manages itself! 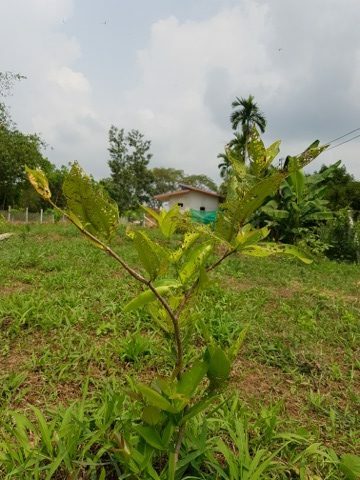 That’s exactly what we want to achieve, only in a food forest it is designed to provides an abundance of fruit, nuts, berries and other edibles all year round. We started with pretty much a clean landscape. We first dug a pond to retain rain water longer on the land further into the dry season and started planting trees about June/July 2016. The soil is very different across the land from light sandy soil to clay. It all needs a lot of rebuilding to make it more fertile for the trees to flourish. Now the trees are in, heavy mulching, feeding the trees and making soil (compost and chicken waste) will be the main objective. 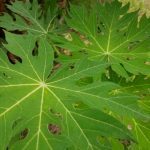 I’ve listed the trees we have planted to date below for our own records and provided links to corresponding websites if you would like more information on a particular plant. 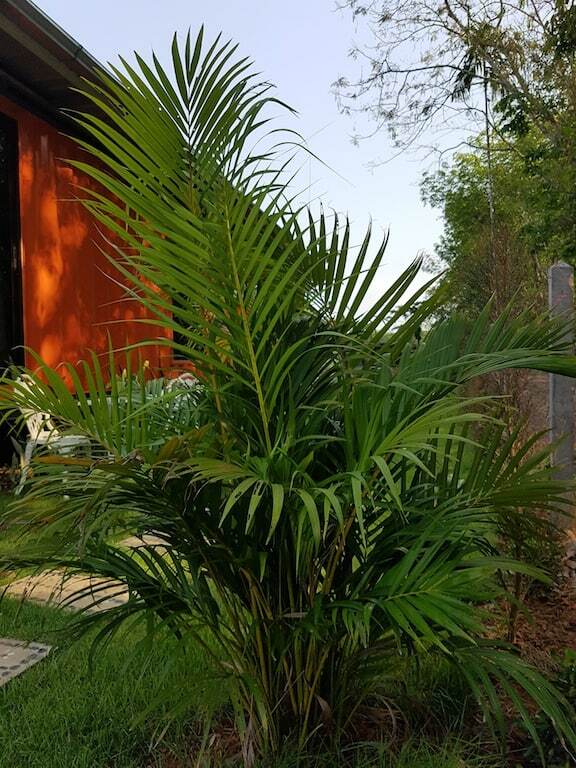 Bismark Palm (not edible) – 2. 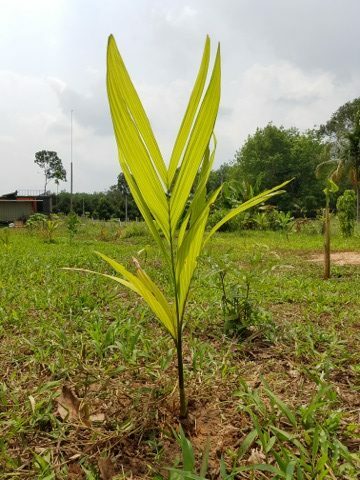 A large, silver leaf palm tree that originates from Madagascar. Named after the first chancellor of the German Empire, Prince Otto von Bismarck. Date Palms – 3. The date palm was probably one of the first cultivated trees due to its edible sweet fruit. 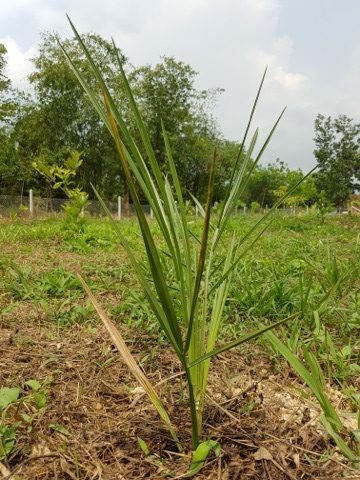 Betel Palm (Mak Palm) – 50. 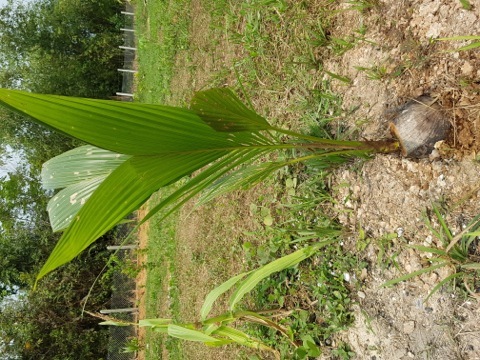 A classic looking palm tree that produces the betel nut. 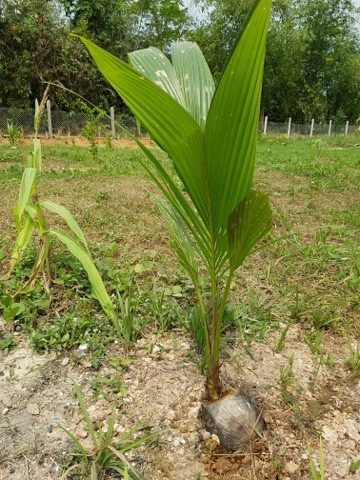 Palm fronds are also used to make eco-friendly plates and utensils. Coconut Palms – 6. These trees produce the most versatile and important crops in the world, coconuts. Parlour Palm – 1. 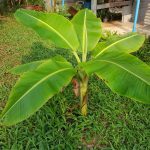 An easy to grow tropical houseplant back home. We have ours in our Thinglish garden by the small ornamental pond. 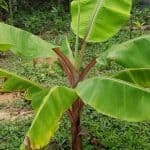 Bananas (Praying Hands, Red, Cavendish, Lady Fingers and Dwarf) 20. Our favorite fruit. 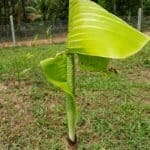 Now I’ve started to collect different varieties of bananas for the food forest. Papaya (male and female) 20. Another of my favorite fruit. 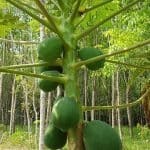 The papaya is easy to grow in Thailand and produces an amazing healthy fruit and seeds, even the leaves can be eaten. 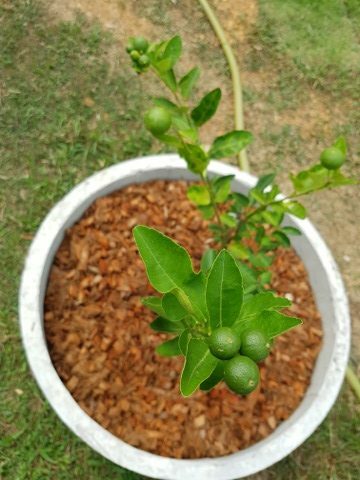 Lemon Trees – 2. Always good to have a couple of lemon trees with plenty of fruit to make healthy drinks with ice and a slice! Lime Trees (mineow) – 3. 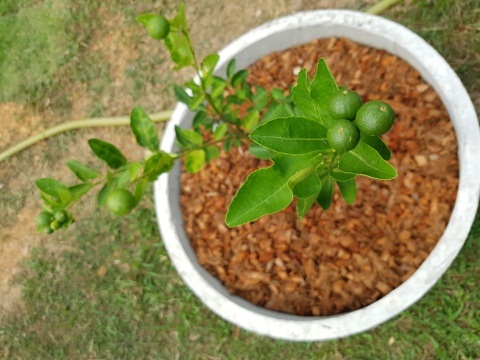 An essential citrus fruit tree that produces fruit and aromatic leaves for Thai cooking. Pomello – 1. 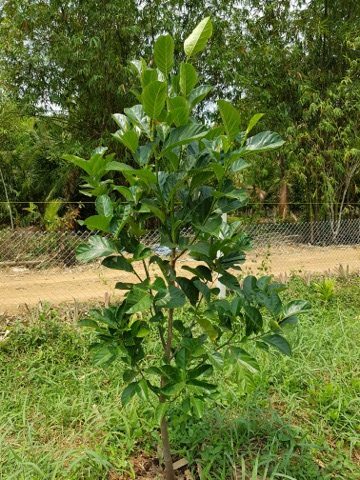 The pomello tree produces the largest citrus fruit in the world. Similar to the grapefruit but no way near as sour. We have one tree near the kitchen garden. We wait for the day when we can walk out back and pick one for breakfast. Mango – 6. 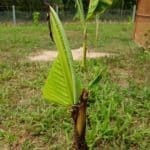 Most of my mango trees were grown from seed in pots when we lived on Koh Chang. They are growing very well here but we don’t expect fruit for between 3 and five years. Purple Mango – A very recent purchase. 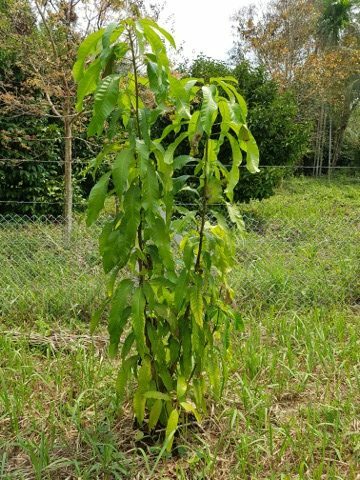 This mango tree, when mature isn’t very high and the fruit hangs low. Ideal for me as I grow older and don’t want to be climbing trees picking fruit. 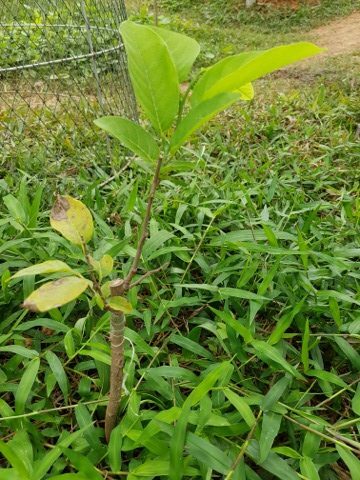 Jackfruit – Another fruit tree I successfully grew from seed. The jack fruit tastes amazing and we also boil the seeds and eat them too. Both are packed with many positive health benefits. Starfruit – 2. 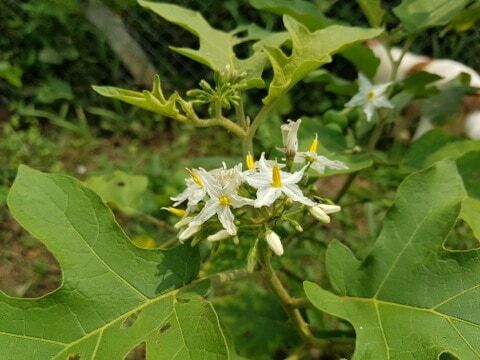 A small tree that produces pink flowers and yellow fruit that when cross-cut looks like a star. It’s very tart but looks awesome and is a great talking point. 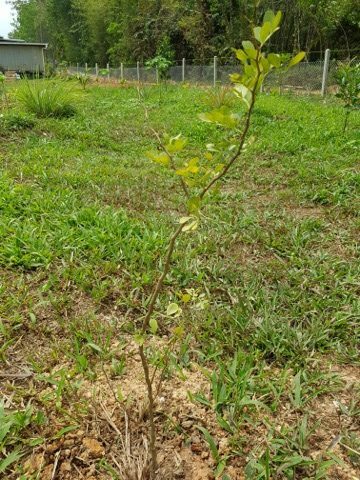 Jabuticaba – 1. The Brazilian tree that produces fruit on it’s trunk. We have yet to have ours fruit but cherish the day when we can taste them. I’ve heard it’s out of this world! Beal Tree – 1. The beal tree is an indigenous tree from India where where Hindus consider it sacred. It produces a hard shelled berry that has many medicinal properties. Quince Tree – 1. An aromatic, pear like, yellow fruit is produced by this ornamental tree. 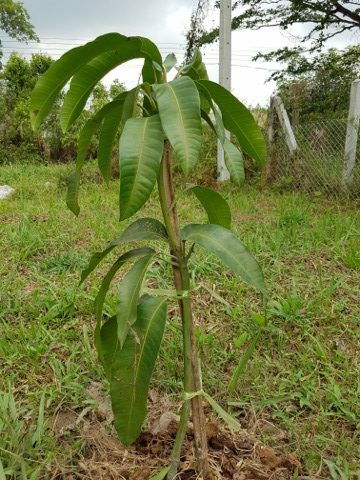 Sapodilla – 1. 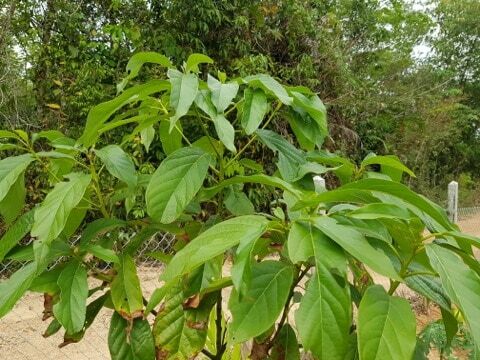 A native to Mexico, this tree produces a energy boosting fruit made from simple sugars like fructose. Wood Apple – 1. The fruit of the wood apple has a similar appearance to the Beal fruit but once you crack the hard shell you’ll discover the sticky brown flesh and white seeds. Pomegranate – 3. 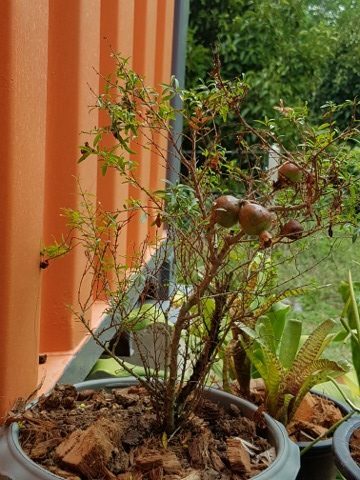 Many Thai houses have a pomegranate tree planted in front them to bring luck. We have three for their nutritionally rich fruit packed with antioxidants. Guava – 3. 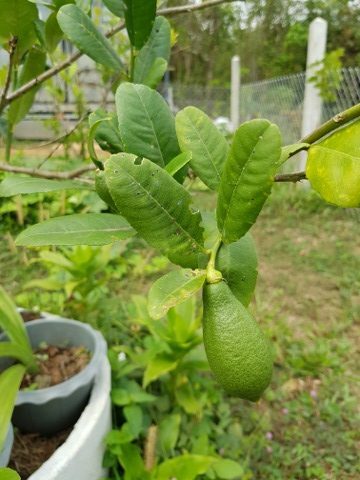 After papaya and banana, guava seems to be the easiest fruit for us to grow in the tropics. We have three small trees and all are now bearing fruit. 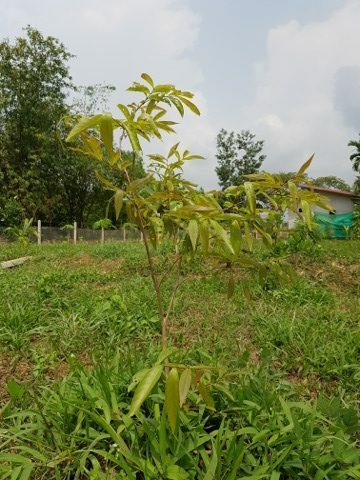 Longan Tree – 2. The longan tree produces a sweet fruit that is often referred to as ‘dragon eye fruit’. The translucent flesh surrounds a black seed hence it’s nick-name. Rambutan – 2. I first encountered the exotic rambutan fruit at JJ market in Bangkok. I’m very lucky to be able to grow it now. Mangostein – 3. 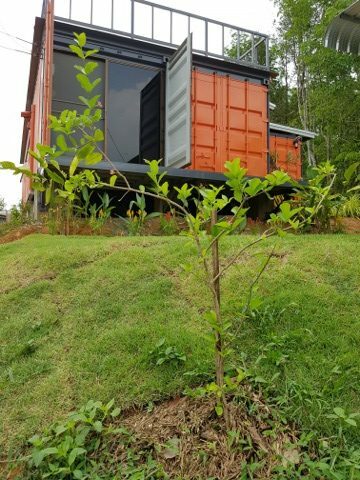 Our property borders a mangostein orchard. We planted one sapling ourselves and have a few self planted trees (but don’t tell the neighbors). Avocado – 3. 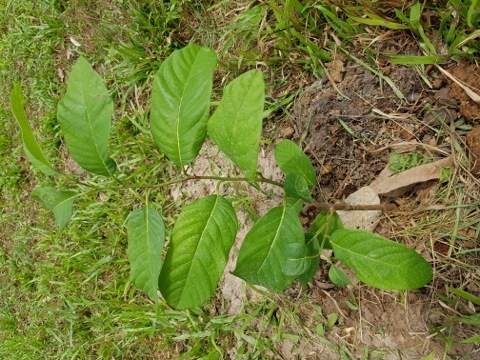 I managed to nurture 4 avocado trees from seed. I gifted one 2ft high plant to my 74 year old neighbor as he had never seen or tasted one. The other three are planted on the shadier side of our land. 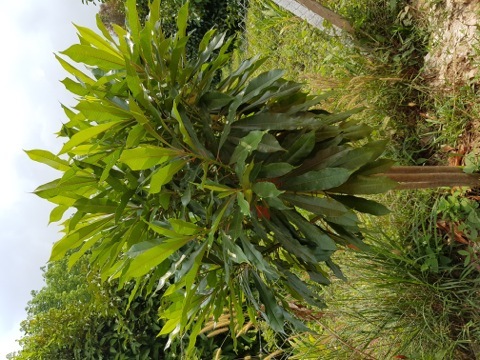 Soursop – 2. 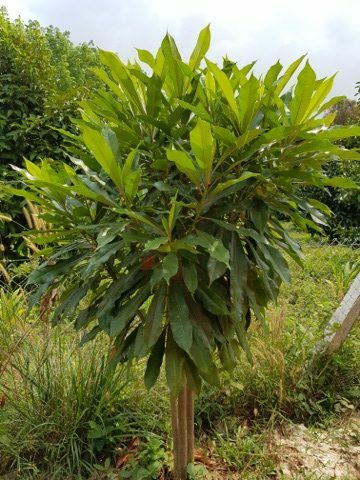 The soursop is also known as a custard apple and paw paw. It’s a great tasting fruit with many health benefits. Rose Apple (chompoo) – 2. The rose apple has the appearance of a red or green pear but doesn’t compare in taste. Our trees suffer from aphid infestations but still seem to grow. Durian – 1. The king of fruit! The huge durian fruit has a distinctive flavor and custardy taste, you either love it or loathe it. The smell (old socks) puts many people off trying it. My wife hates it, I love it! We got one tree, a long way from the house! 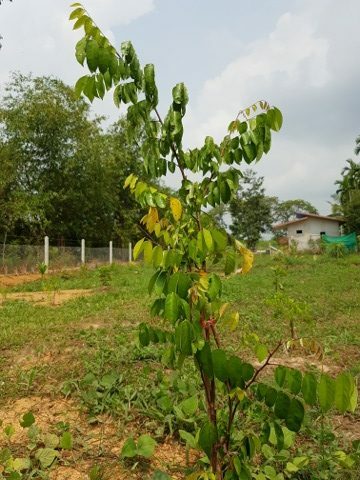 Thai Cherry Tree – 1. Another recent addition to the garden. We found this small cherry tree in our local market. The cherries are sour but the flowers look very sweet. Coffee – 3. 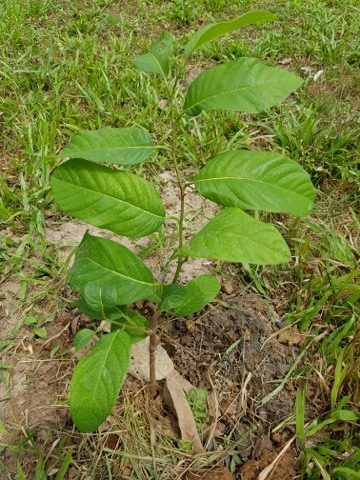 We were gifted one coffee plant and bought two before to see if we could grow coffee in south Thailand. Will let you know if I give up tea and start to roast our own coffee! Turkey Berry – 3. The turkey berry is a wild eggplant and one of the key ingredients for Thai green curry. 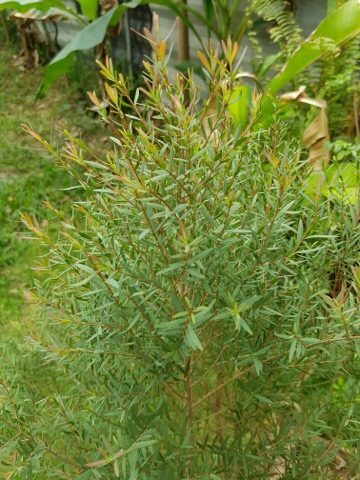 I brought these cuttings with me from Koh Chang where I had a 2 meter high bush. Mulberry Trees – 4. We have four small trees around the property and there is no better way to starting the day than adding a handful of fresh mulberries to my breakfast in the morning after feeding the chickens and applying water to the trees. Surinam Cherry -1. 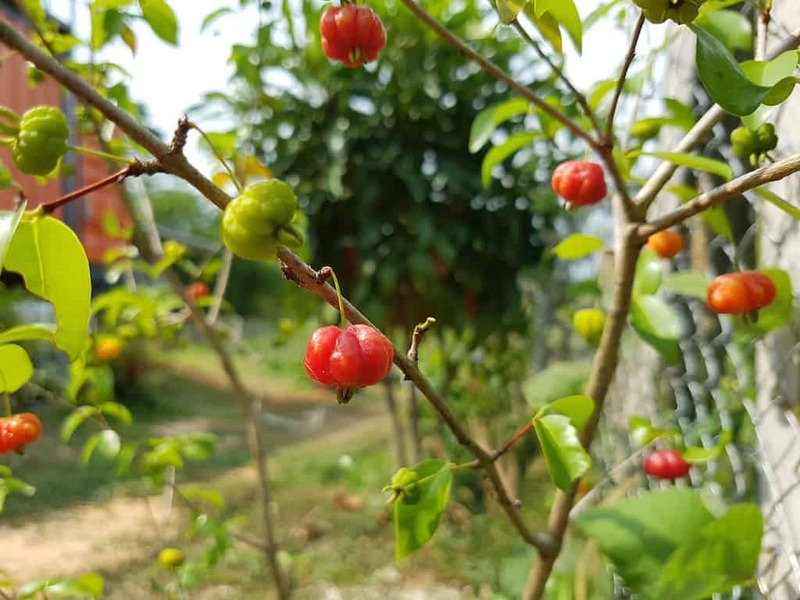 We first thought this shrub was a star gooseberry but since the cherries recently ripened we discovered it was a surinam cherry. A native plant of South America with unique looking and tasting fruit high in vitamin C and A. 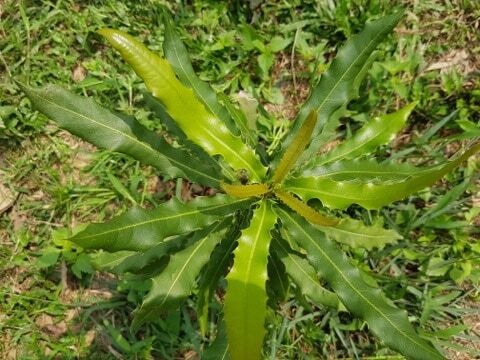 We also discover in Uruguay they use the leaves for tea. So we will be making a brew and see what that is like! Dwarf Pomegranate – 1. We positioned our dwarf pomegranate on the back deck. It’s a mini-me of the larger tree and fruits. 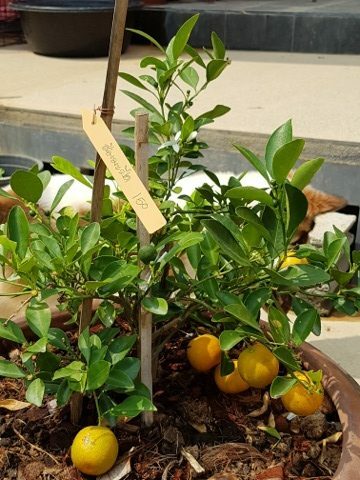 Kumquat – 1. Another ornamental dwarf tree that is constantly bearing fruit and flowers. The kumquat is a nice neighbor on the back deck for our dwarf pomegranate. 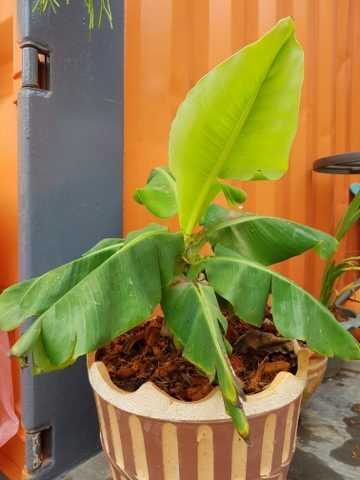 Dwarf Banana – 1. 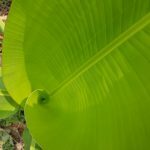 Another variation of the many banana trees. This one, possible a dwarf Cavendish joins our other dwarf varieties on the back deck. Macadamia Nut – 1. 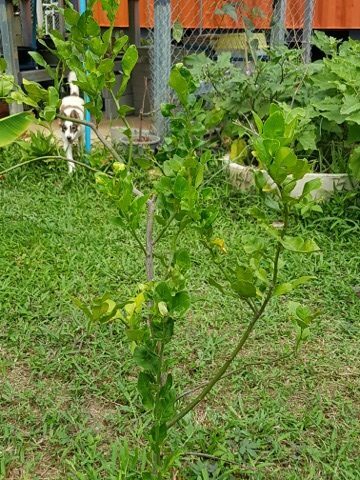 We don’t have enough nut trees but this macadamia nut tree is a thorny leaf beauty. It’s going to look magnificent when it grows up. Dragon Fruit (red and white) – 7. The dragon fruit has to be one of the most incredible looking fruits. No great shakes to taste but hands down it wins on style over substance every time. 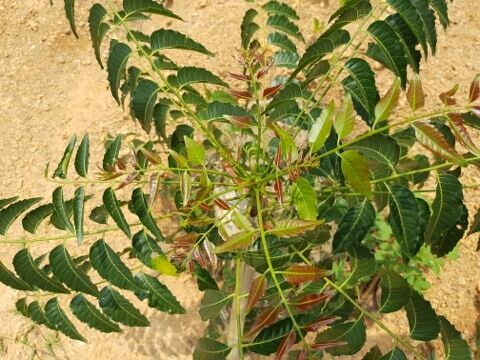 Neem Tree – 4. 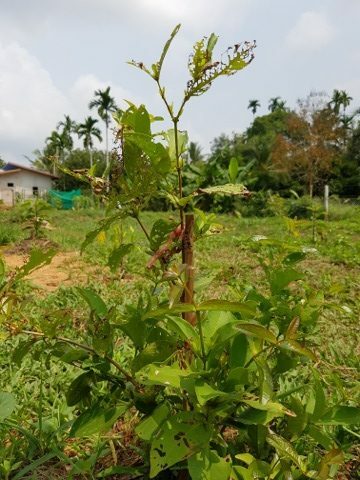 The neem tree is called the wonder tree and for no small reason. The bark, leaves, seeds, roots, flower, and fruit are all used to make medicine or used as food. Dok Kae – 4. 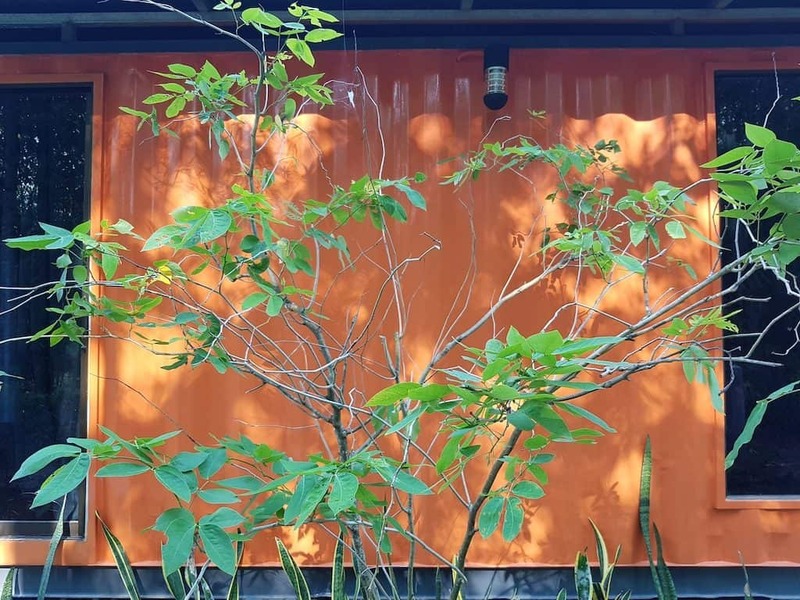 This fast growing tree is commonly known as the Hummingbird Tree outside Thailand as the flowers it produces has a passing resemblance the of the small bird. Dok kae flowers are either red or white and are common in Thai dishes such as Nam Phrik. Cha-om – 4. 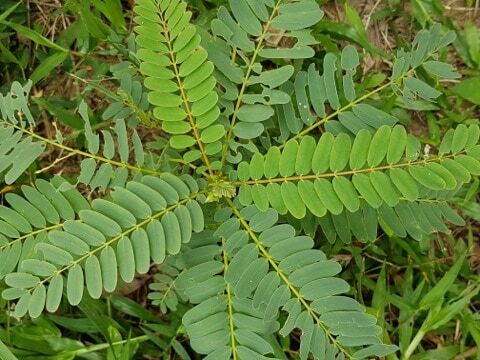 A popular plant in Thailand which is grown to eat the fern like leaves raw in salads or as an addition to northern Thai cuisine. 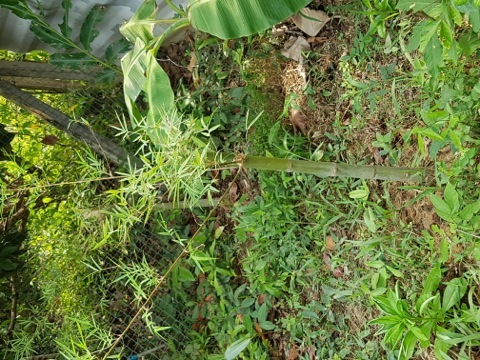 Buddha Belly Bamboo – 1. This bamboos name aptly describes it’s appearance. 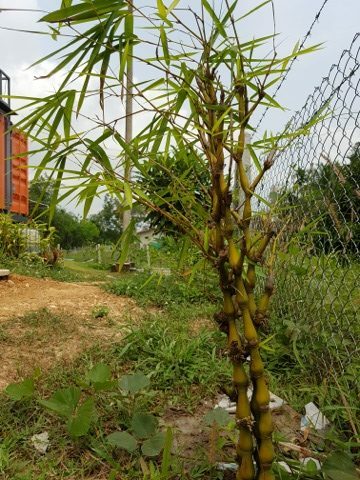 Golden Common Bamboo – 3. 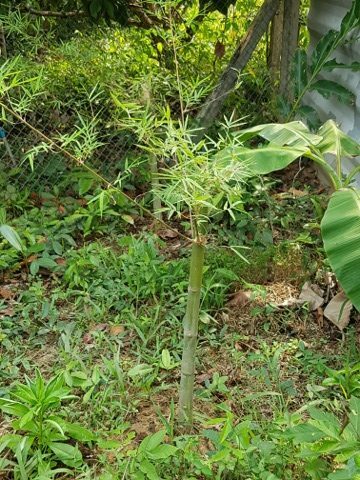 We strategically planted three of these bamboo plants in one corner of the garden we have left wild for diversification. When it grows it will shade the house from the morning sun. Pong Pong (not edible) 5. A beautiful shade bearing tree with stunning flowers and glossy green leaves. 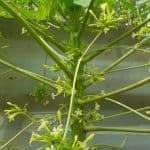 I remember the first time I saw pong pong seeds, which are the size of tennis balls, and been growing then ever since. 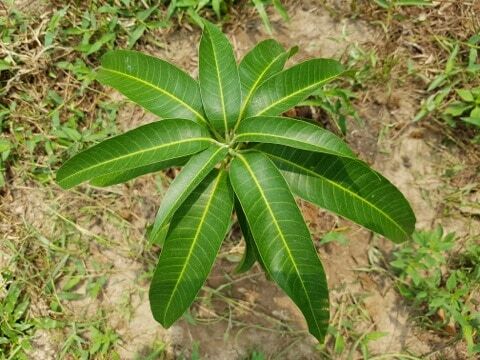 Sendang Tree (non edible) 7. 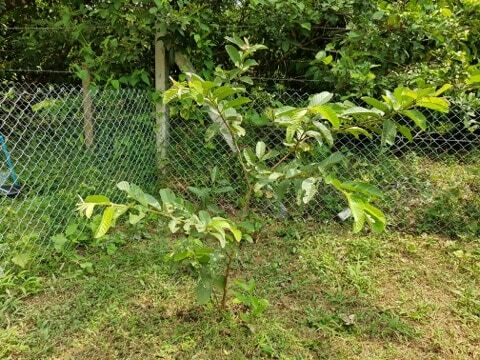 An ornamental tree we planted down the fence line of our Thinglish country garden. 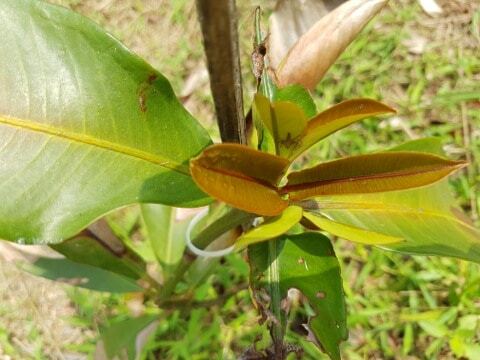 The tree is grey/green with top tips of red. 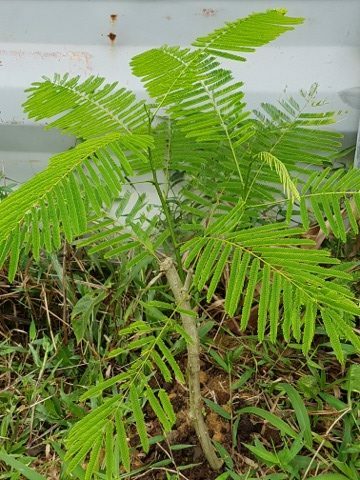 Dwarf Golden Rain Tree – Ton Khun Kat (non edible) 1. 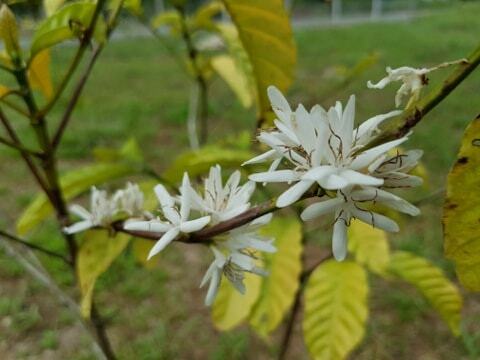 It is the national tree of Thailand and its bloom is also the national flower of Thailand. 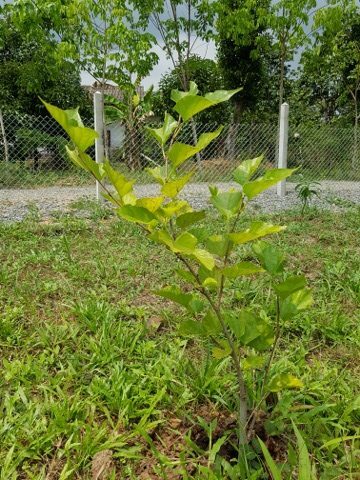 Calabash Tree – Nam tao (non edible) – 1. 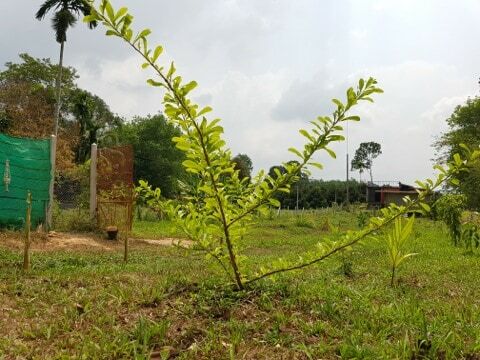 The nam tao is the first tree we planted on our land. 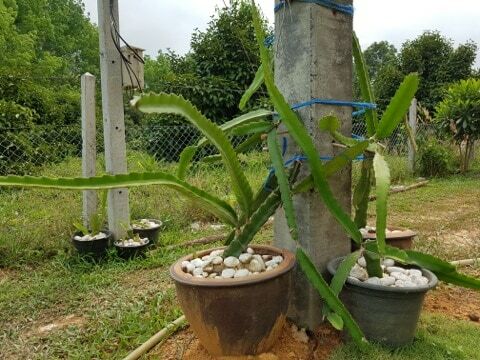 I bought it from our first visit to Konpludthin Fishing Park while living on Koh Chang and kept it in a pot. It’s loving it’s new home! It produces huge grapefruit size fruits but unfortunately are not edible to us humans. I’ll update this list as time goes by. 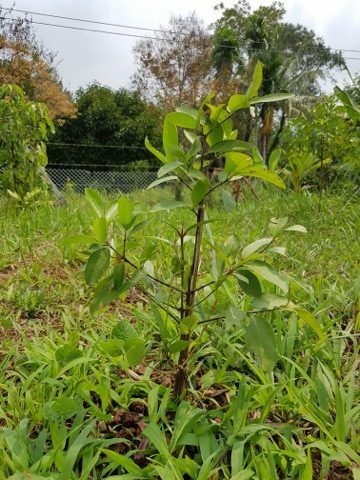 Once the rainy season starts, we will resume planting beneficial smaller trees, bushes and ground cover crops in between the main trees of our evolving food forest. 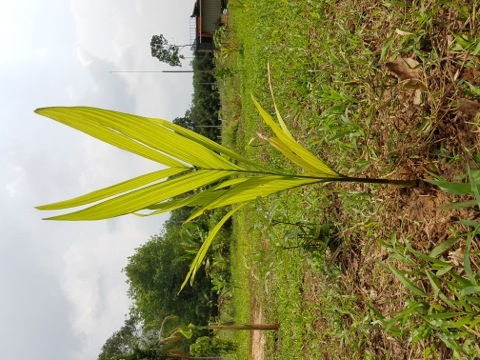 These companion plants will help build the soil and provide nutrients like nitrogen for the larger trees. In turn, as the trees mature, they provide shade and mico-climates for life to flourish on many different levels, just like a jungle! We have a lot of work cut out for us in the future but look forward to reaping the bounty of fresh fruits and nuts packed with healthy micro nutrients and no chemicals or preservatives for many years to come. Other books, vids and authors I recommend: Sepp Holzer, Permaculture Gardener; Paul Stamets, Mycelium Running; Ruth Stout, Straw Method; The Voynich Manuscript; Ancient Egyptian herioglyphic texts such as Horopolo; any historical texts of indigenous plants in your region may guide your observation of beneficial insects and discovery of and experiments with techniques which may have been locally forgotten. 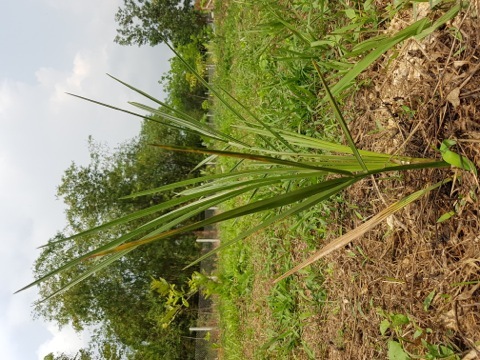 I am currently writing an article on this general topic of soil restoration project for publication and will provide text link to Twitter upon completion. Thanks Dan. The cinematography of the film looks amazing. Can’t wait to watch it all. And thanks for the book recommendations. That will keep us entertained throughout the rainy season nights ahead.